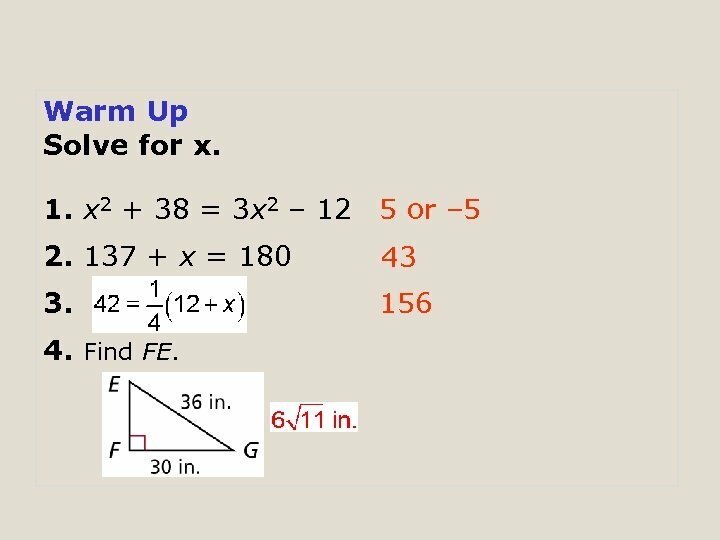 Warm Up Solve for x. 1. x 2 + 38 = 3 x 2 – 12 5 or – 5 2. 137 + x = 180 43 3. 156 4. Find FE. 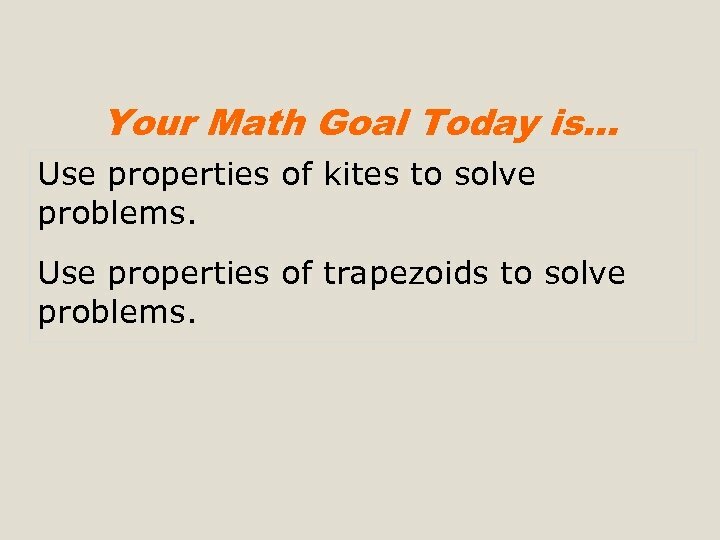 Your Math Goal Today is… Use properties of kites to solve problems. 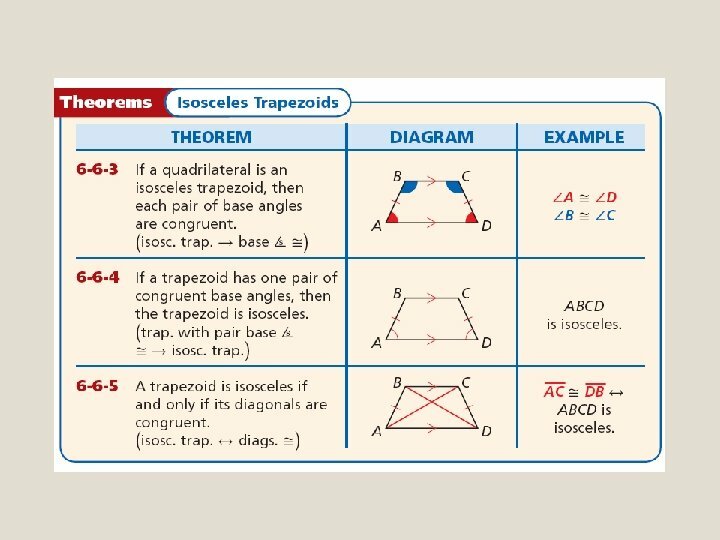 Use properties of trapezoids to solve problems. 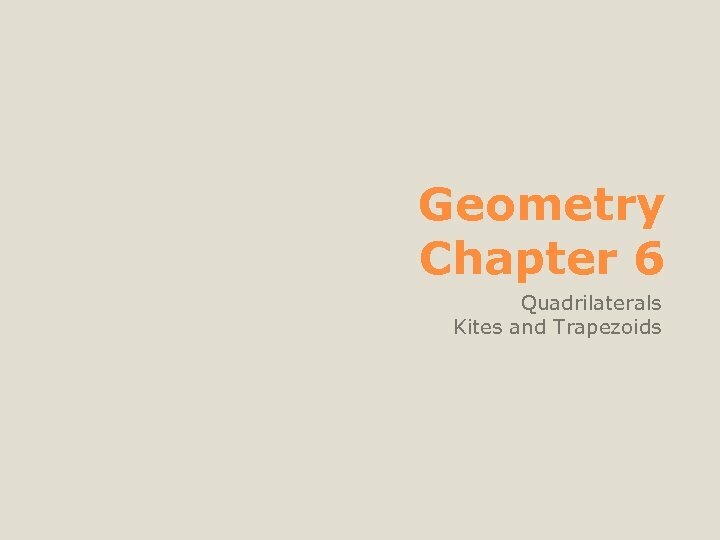 A kite is a quadrilateral with exactly two pairs of congruent consecutive sides. 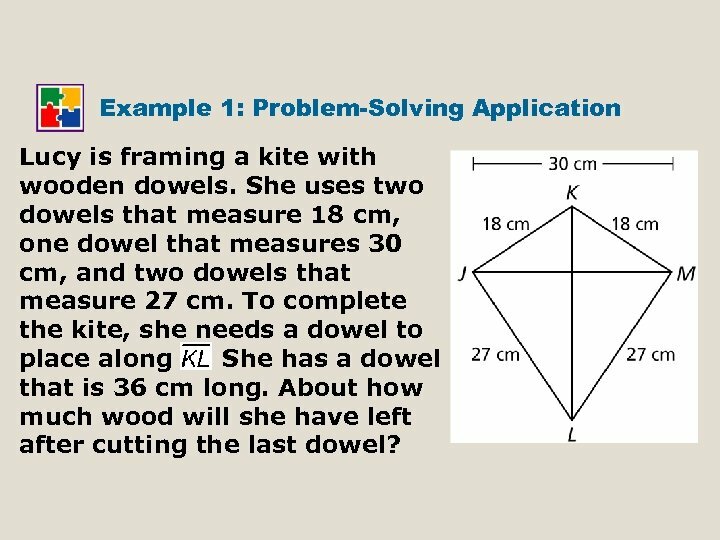 Example 1: Problem-Solving Application Lucy is framing a kite with wooden dowels. She uses two dowels that measure 18 cm, one dowel that measures 30 cm, and two dowels that measure 27 cm. To complete the kite, she needs a dowel to place along. She has a dowel that is 36 cm long. About how much wood will she have left after cutting the last dowel? 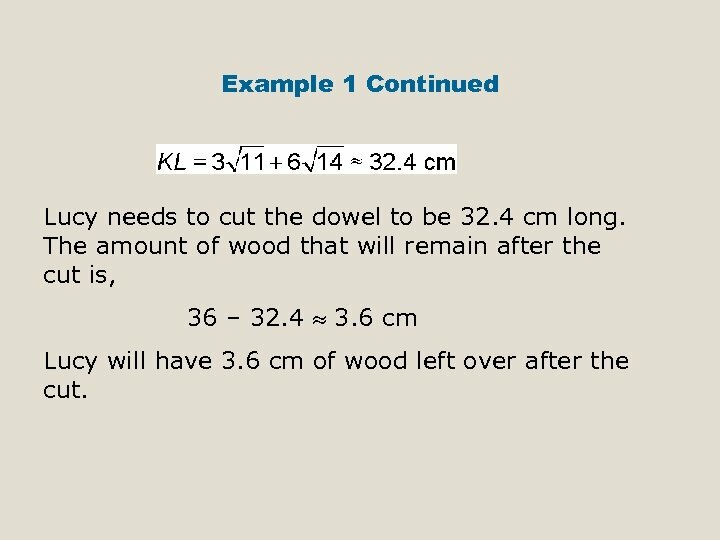 Example 1 Continued 1 Understand the Problem The answer will be the amount of wood Lucy has left after cutting the dowel. 2 Make a Plan The diagonals of a kite are perpendicular, so the four triangles are right triangles. Let N represent the intersection of the diagonals. 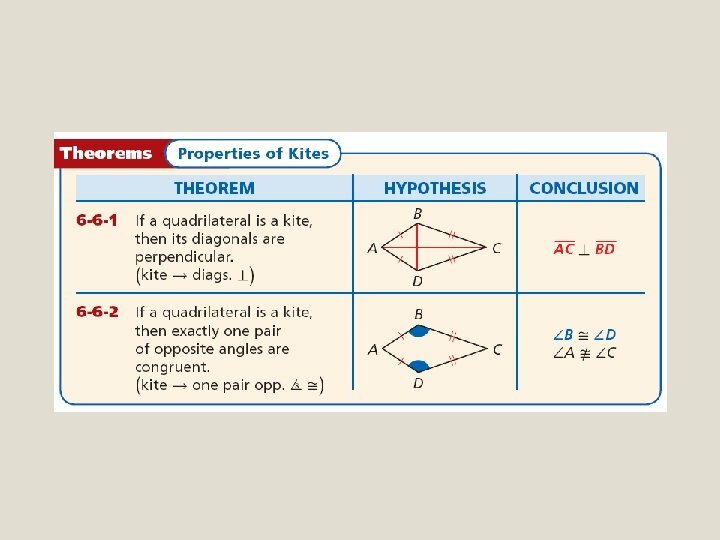 Use the Pythagorean Theorem and the properties of kites to find , and. Add these lengths to find the length of. 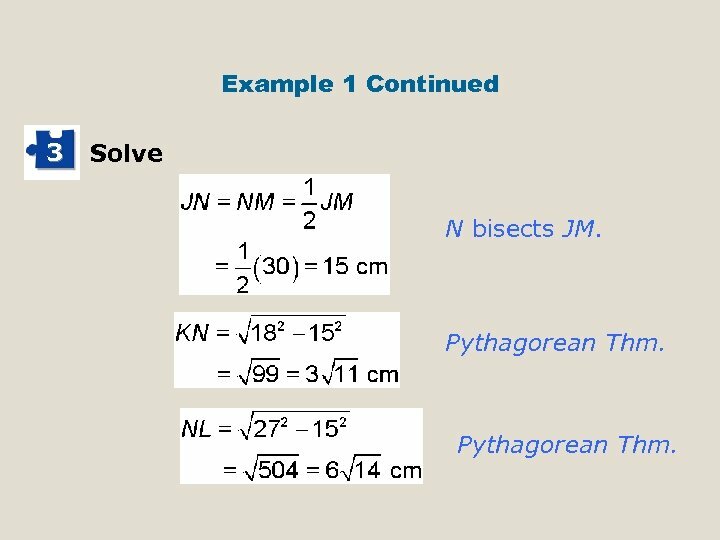 Example 1 Continued 3 Solve N bisects JM. Pythagorean Thm. Example 1 Continued Lucy needs to cut the dowel to be 32. 4 cm long. The amount of wood that will remain after the cut is, 36 – 32. 4 3. 6 cm Lucy will have 3. 6 cm of wood left over after the cut. 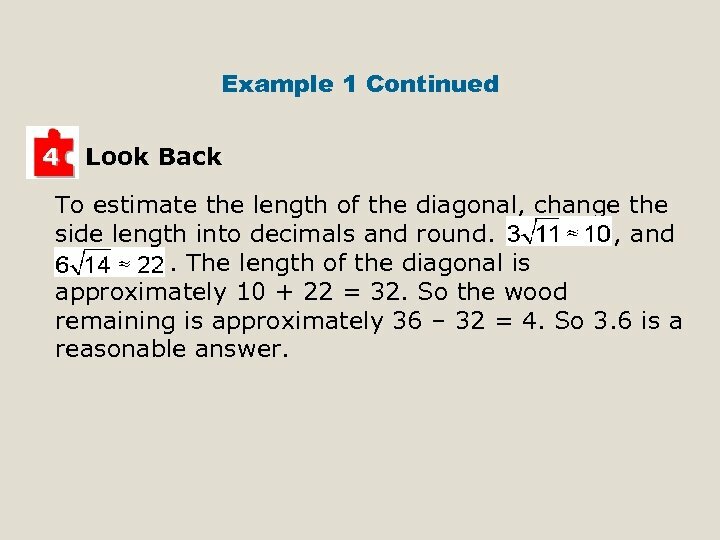 Example 1 Continued 4 Look Back To estimate the length of the diagonal, change the side length into decimals and round. , and. The length of the diagonal is approximately 10 + 22 = 32. So the wood remaining is approximately 36 – 32 = 4. So 3. 6 is a reasonable answer. In Your Notes What if. . . ? 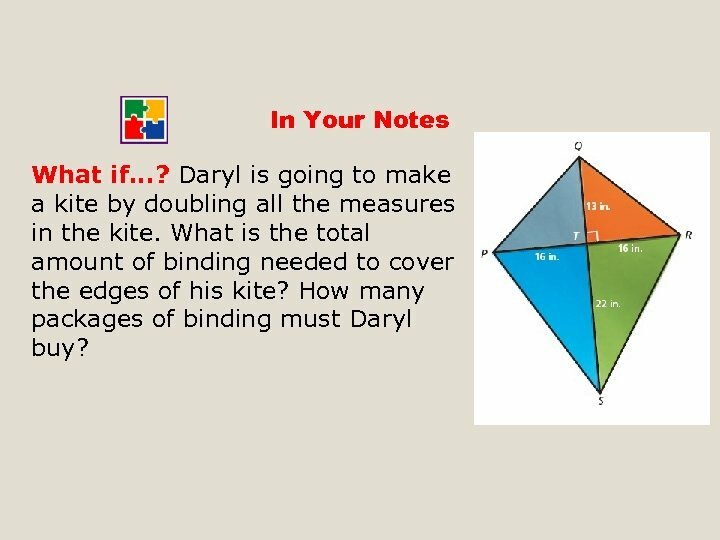 Daryl is going to make a kite by doubling all the measures in the kite. What is the total amount of binding needed to cover the edges of his kite? 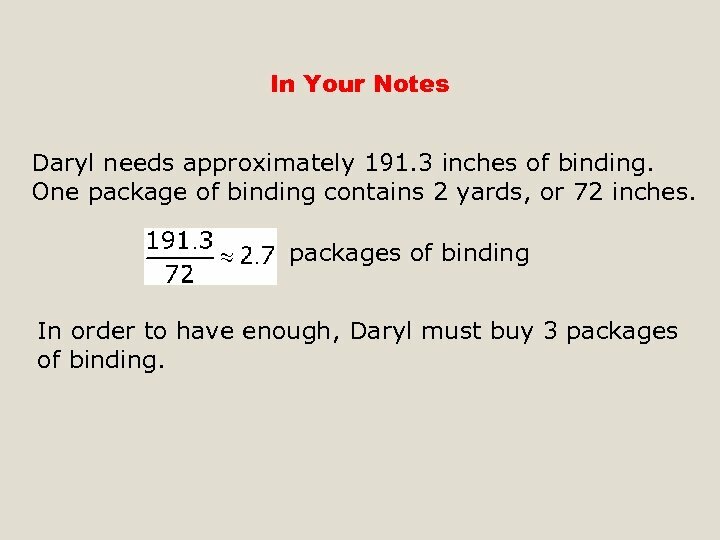 How many packages of binding must Daryl buy? 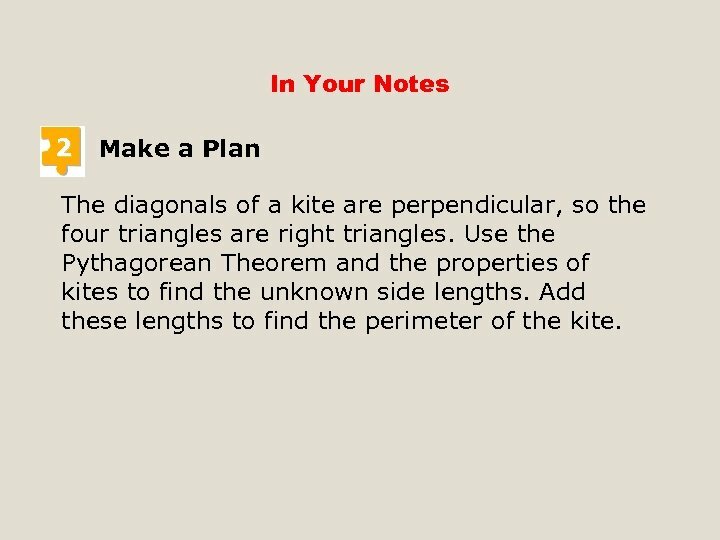 In Your Notes 2 Make a Plan The diagonals of a kite are perpendicular, so the four triangles are right triangles. 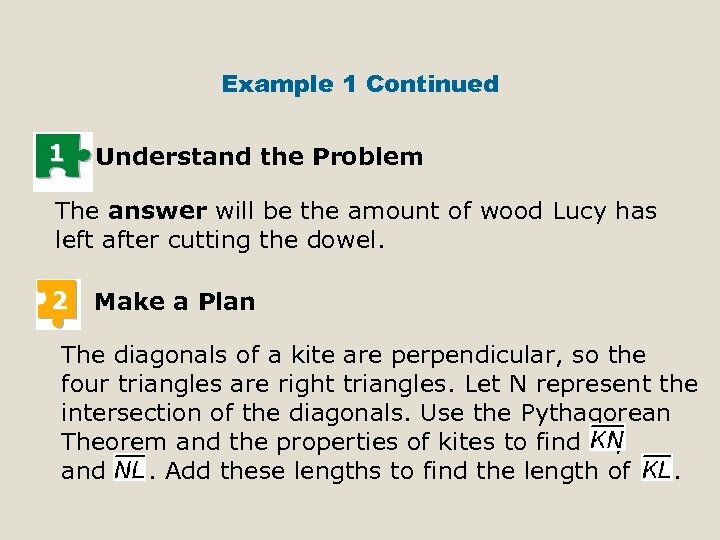 Use the Pythagorean Theorem and the properties of kites to find the unknown side lengths. 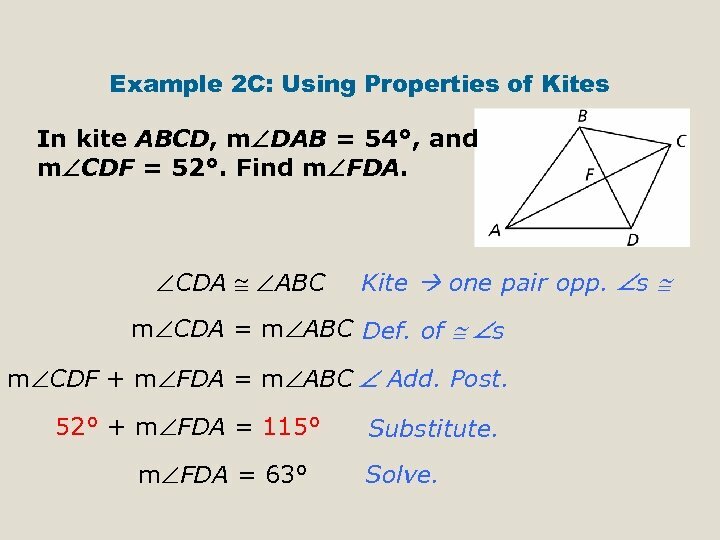 Add these lengths to find the perimeter of the kite. 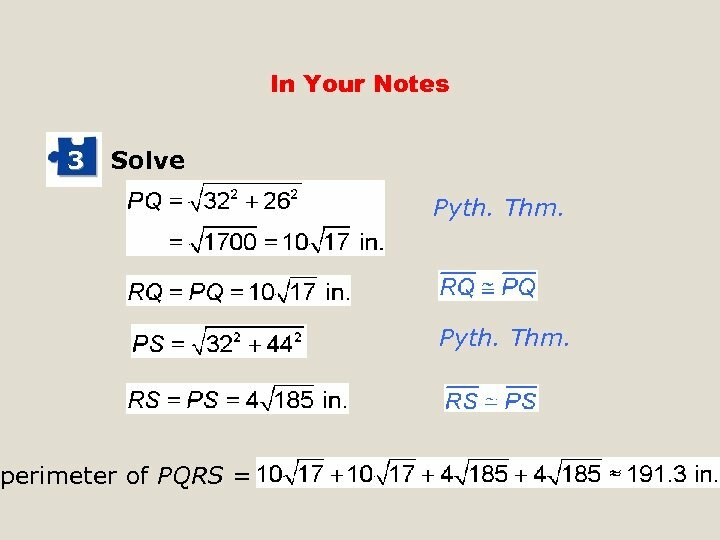 In Your Notes 3 Solve perimeter of PQRS = Pyth. Thm. In Your Notes Daryl needs approximately 191. 3 inches of binding. One package of binding contains 2 yards, or 72 inches. 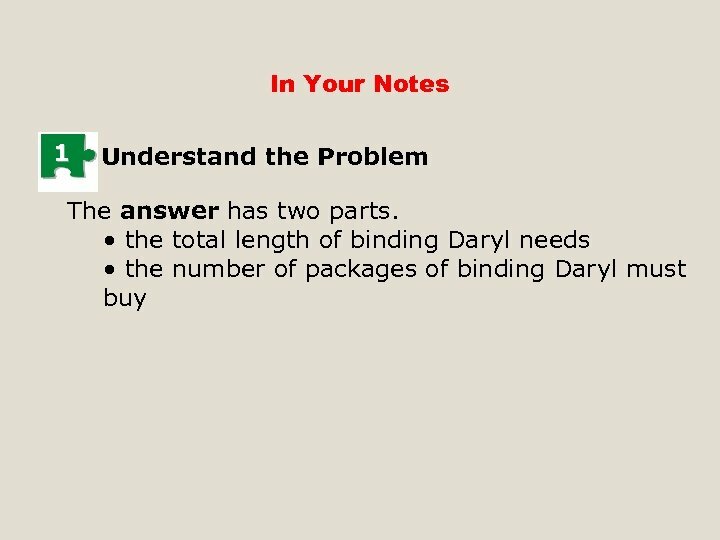 packages of binding In order to have enough, Daryl must buy 3 packages of binding. 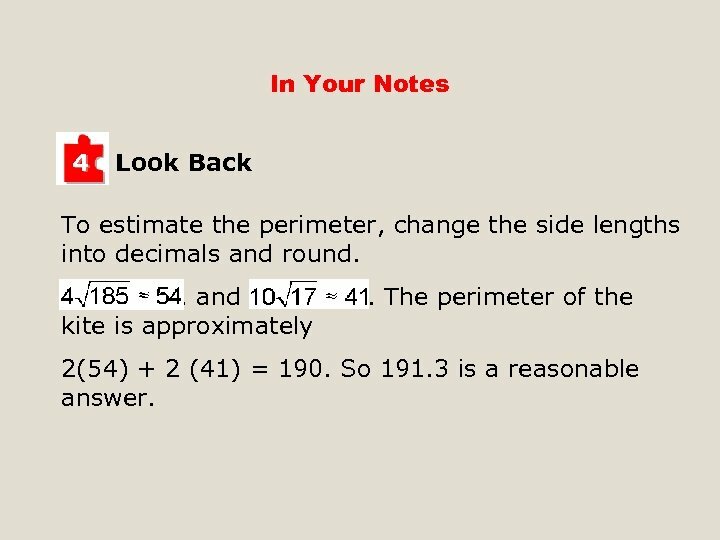 In Your Notes 4 Look Back To estimate the perimeter, change the side lengths into decimals and round. , and kite is approximately . The perimeter of the 2(54) + 2 (41) = 190. So 191. 3 is a reasonable answer. 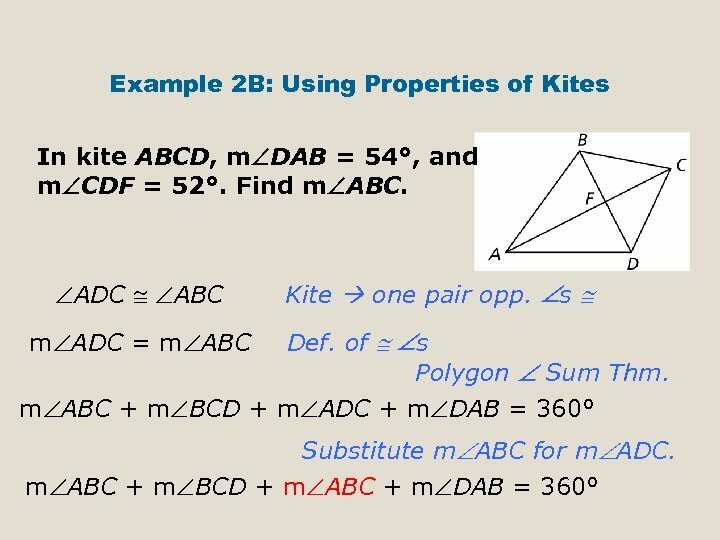 Example 2 A: Using Properties of Kites In kite ABCD, m DAB = 54°, and m CDF = 52°. Find m BCD. Kite cons. sides ∆BCD is isos. 2 sides isos. ∆ CBF CDF isos. ∆ base s m CBF = m CDF Def. of s m BCD + m CBF + m CDF = 180° Polygon Sum Thm. 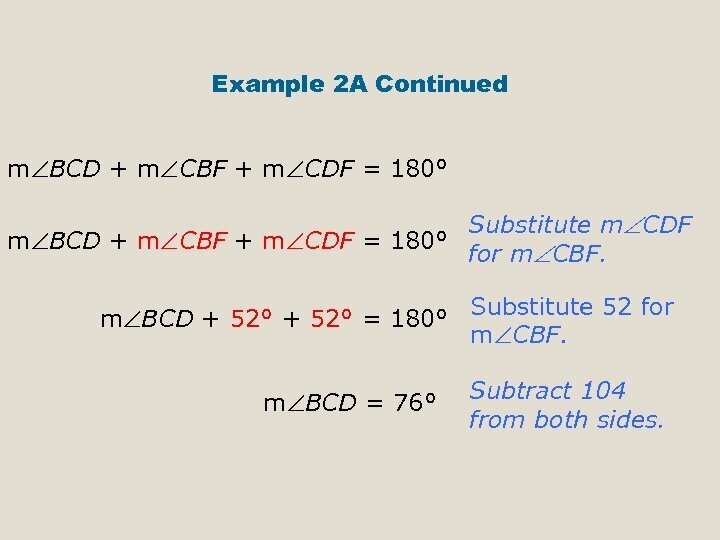 Example 2 A Continued m BCD + m CBF + m CDF = 180° Substitute m CDF m BCD + m CBF + m CDF = 180° for m CBF. m BCD + 52° = 180° m BCD = 76° Substitute 52 for m CBF. Subtract 104 from both sides. 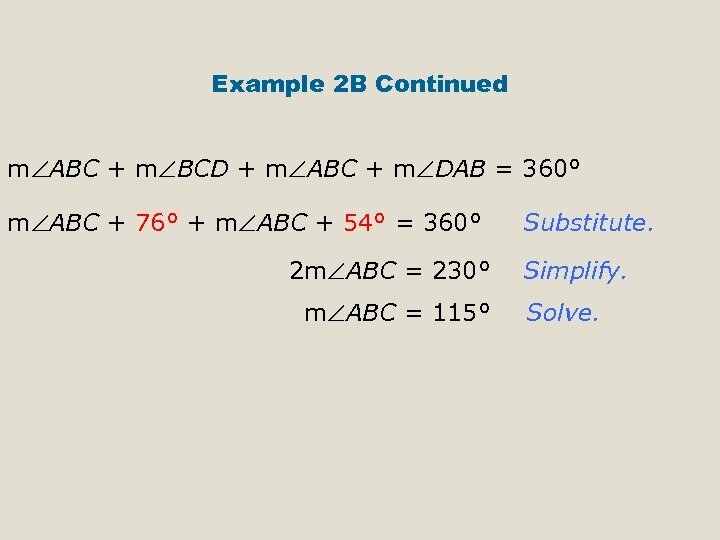 Example 2 B Continued m ABC + m BCD + m ABC + m DAB = 360° m ABC + 76° + m ABC + 54° = 360° 2 m ABC = 230° m ABC = 115° Substitute. Simplify. Solve. 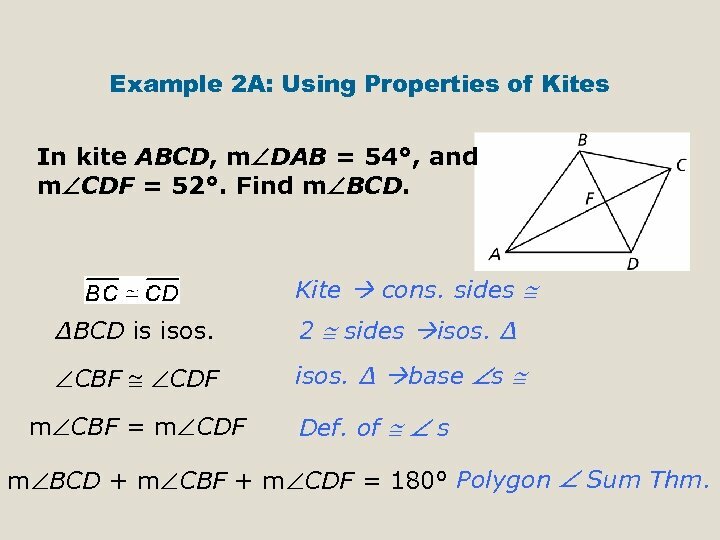 Example 2 C: Using Properties of Kites In kite ABCD, m DAB = 54°, and m CDF = 52°. Find m FDA. 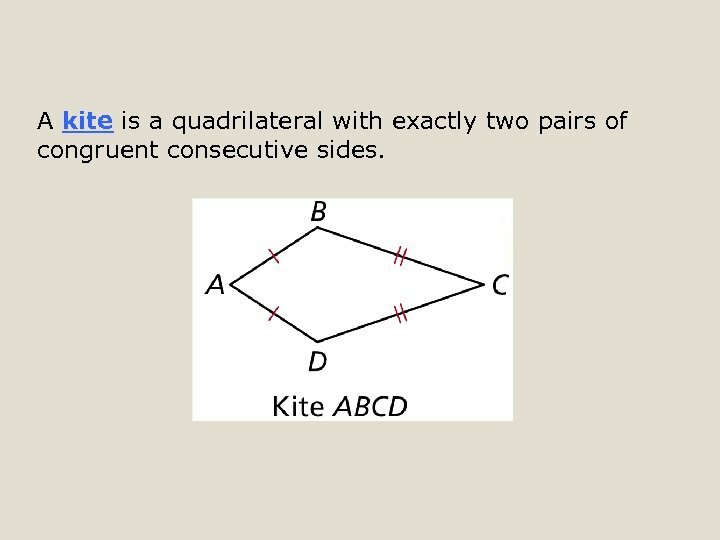 CDA ABC Kite one pair opp. s m CDA = m ABC Def. of s m CDF + m FDA = m ABC Add. Post. 52° + m FDA = 115° m FDA = 63° Substitute. Solve. 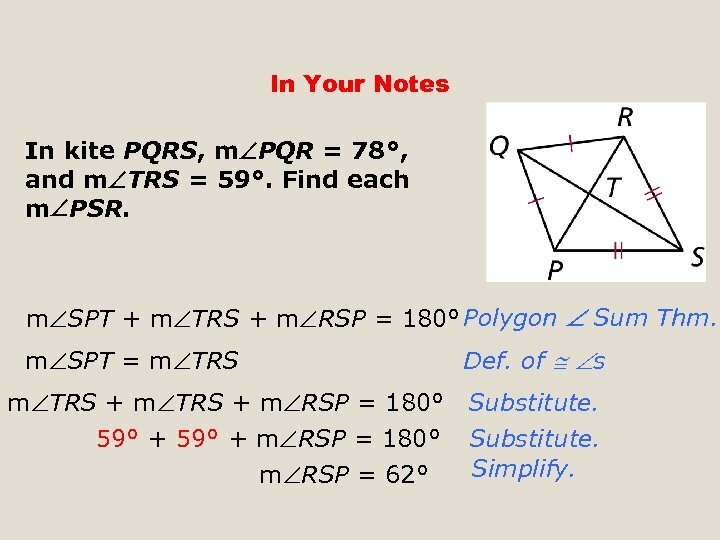 In Your Notes m PQR + m QRP + m QPR = 180° Polygon Sum Thm. 78° + m QRT + m QPT = 180° Substitute 78 for m PQR. 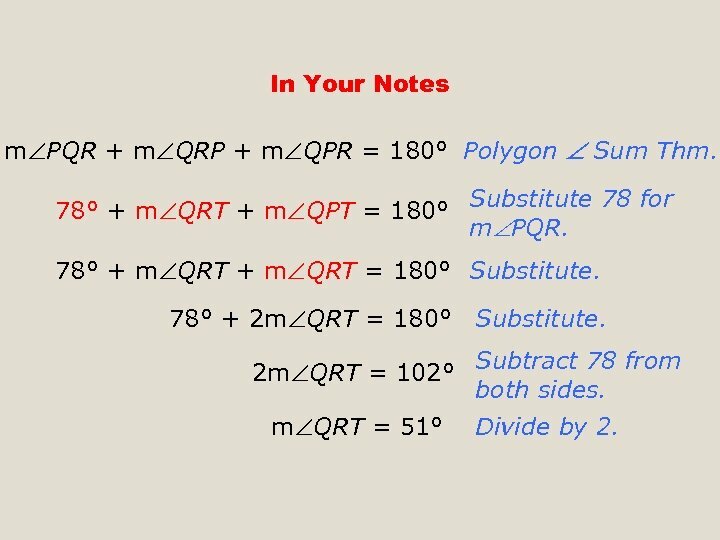 78° + m QRT = 180° Substitute. 78° + 2 m QRT = 180° Substitute. 2 m QRT = 102° Subtract 78 from both sides. m QRT = 51° Divide by 2. 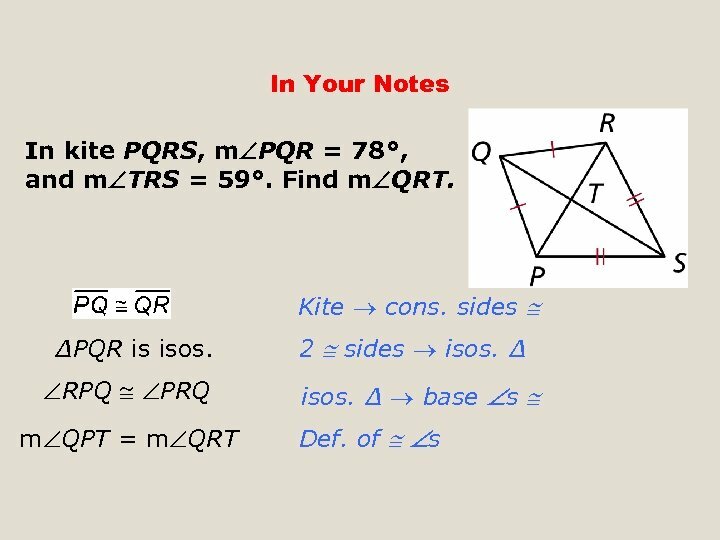 In Your Notes In kite PQRS, m PQR = 78°, and m TRS = 59°. 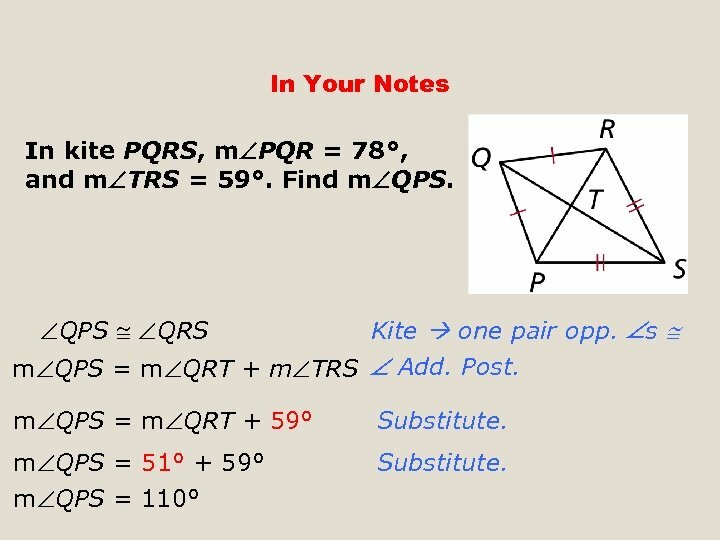 Find m QPS QRS Kite one pair opp. s m QPS = m QRT + m TRS Add. Post. m QPS = m QRT + 59° Substitute. m QPS = 51° + 59° m QPS = 110° Substitute. 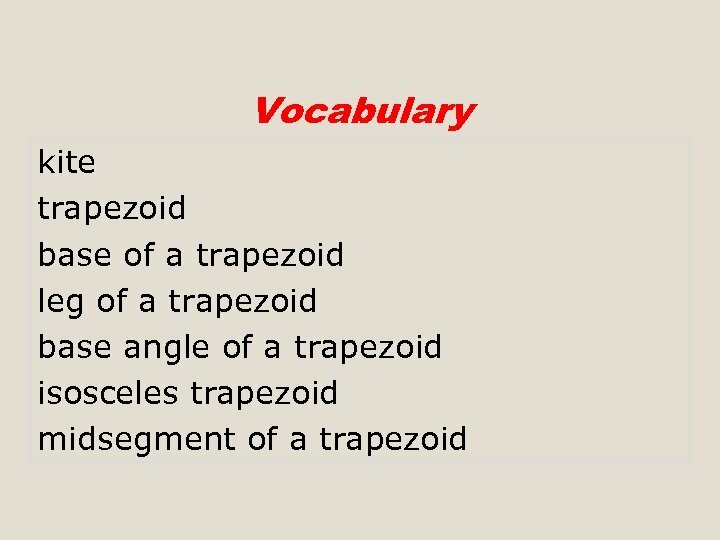 A trapezoid is a quadrilateral with exactly one pair of parallel sides. Each of the parallel sides is called a base. The nonparallel sides are called legs. 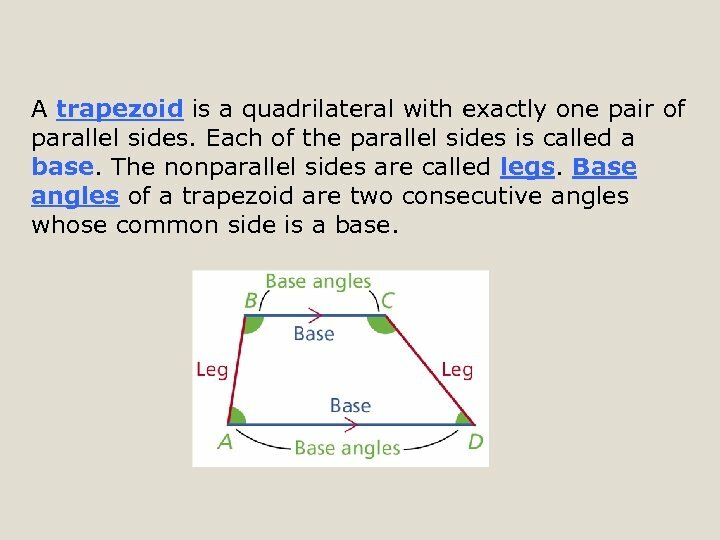 Base angles of a trapezoid are two consecutive angles whose common side is a base. 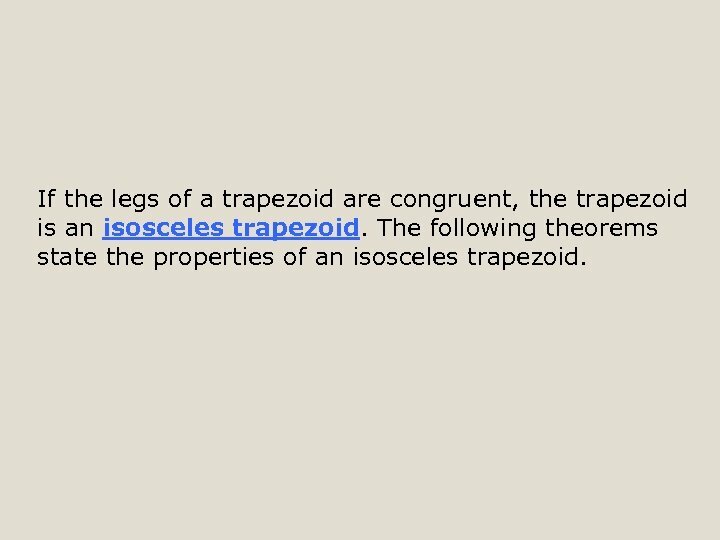 If the legs of a trapezoid are congruent, the trapezoid is an isosceles trapezoid. 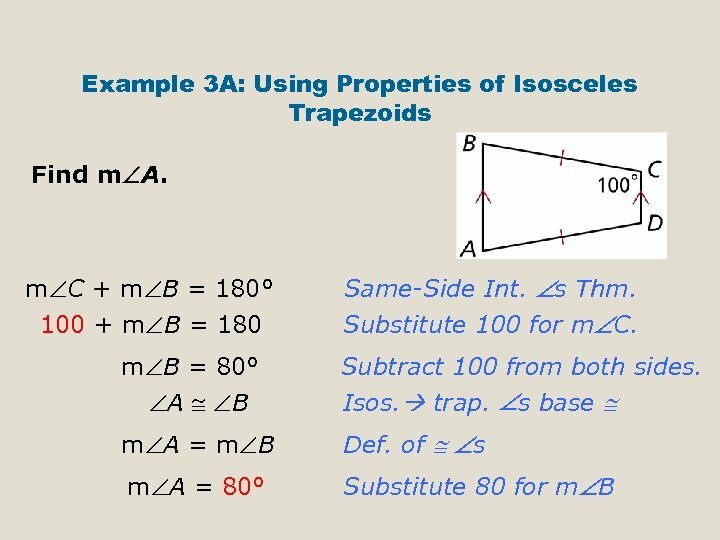 The following theorems state the properties of an isosceles trapezoid. 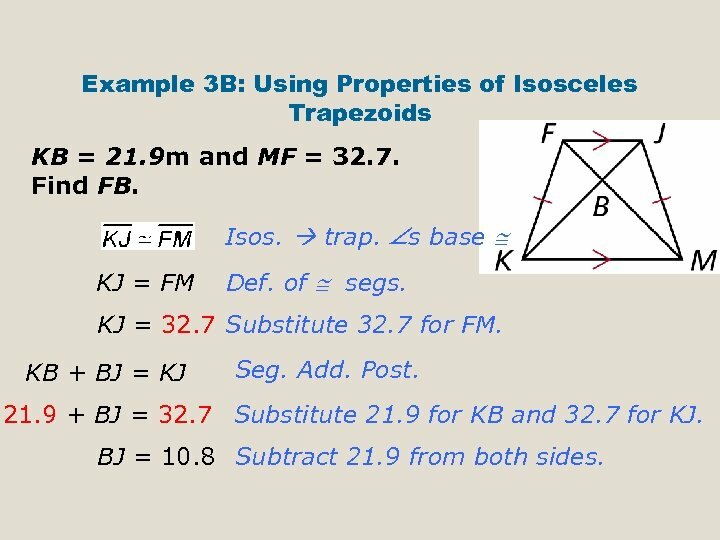 Example 3 B: Using Properties of Isosceles Trapezoids KB = 21. 9 m and MF = 32. 7. Find FB. Isos. trap. s base KJ = FM Def. of segs. KJ = 32. 7 Substitute 32. 7 for FM. 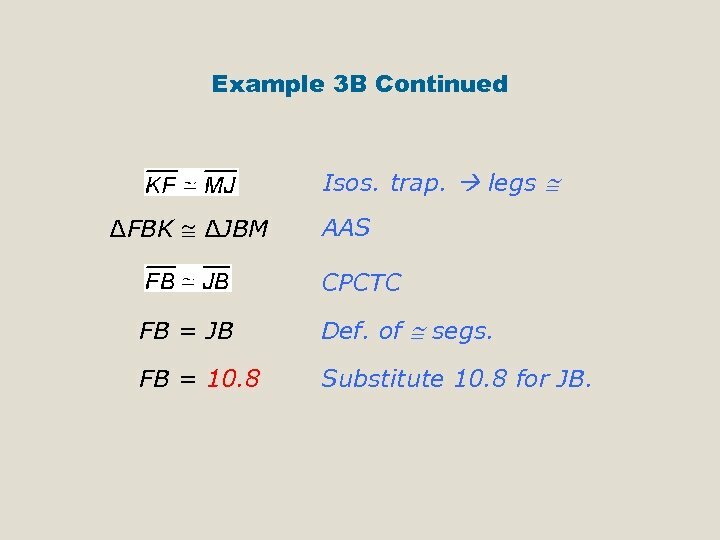 KB + BJ = KJ Seg. Add. Post. 21. 9 + BJ = 32. 7 Substitute 21. 9 for KB and 32. 7 for KJ. BJ = 10. 8 Subtract 21. 9 from both sides. Example 3 B Continued Isos. trap. 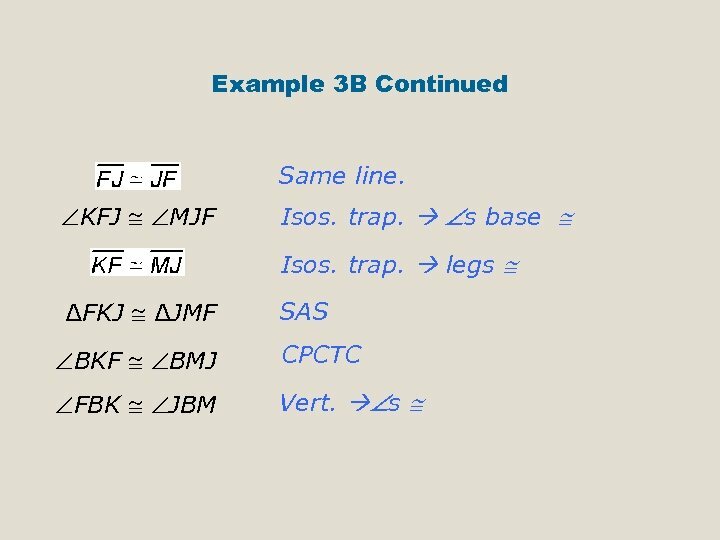 legs ∆FBK ∆JBM AAS CPCTC FB = JB Def. of segs. FB = 10. 8 Substitute 10. 8 for JB. 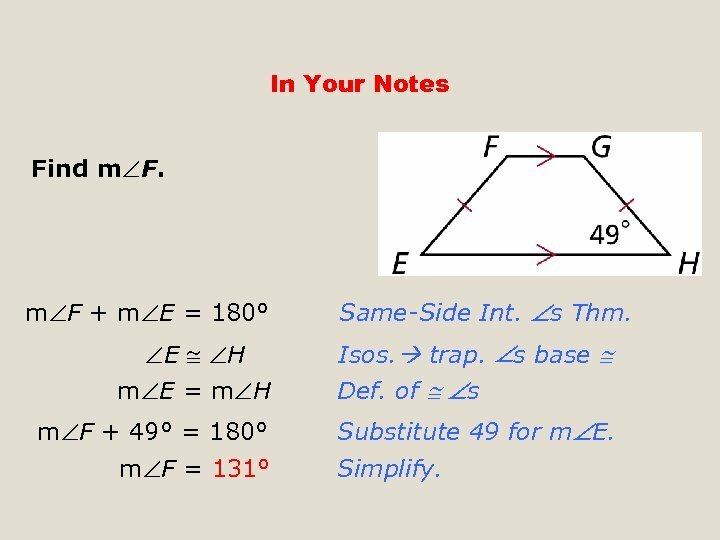 In Your Notes Find m F + m E = 180° E H m E = m H m F + 49° = 180° m F = 131° Same-Side Int. s Thm. Isos. trap. s base Def. of s Substitute 49 for m E. Simplify. 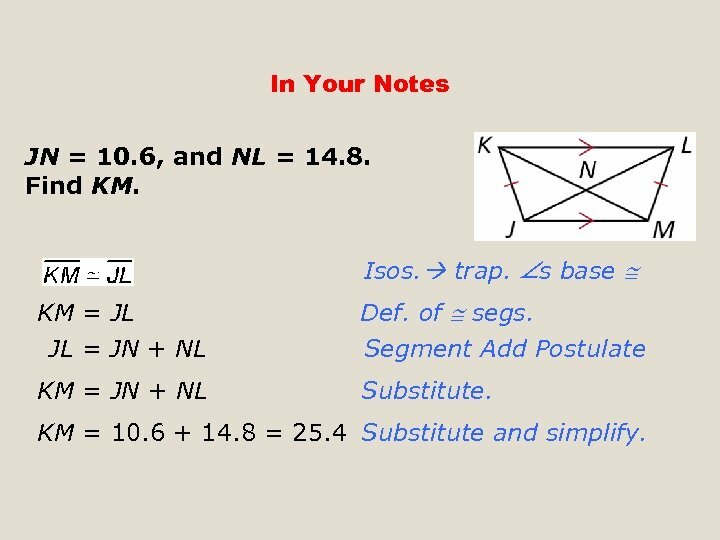 In Your Notes JN = 10. 6, and NL = 14. 8. Find KM. Isos. trap. s base KM = JL JL = JN + NL Def. of segs. KM = JN + NL Substitute. Segment Add Postulate KM = 10. 6 + 14. 8 = 25. 4 Substitute and simplify. 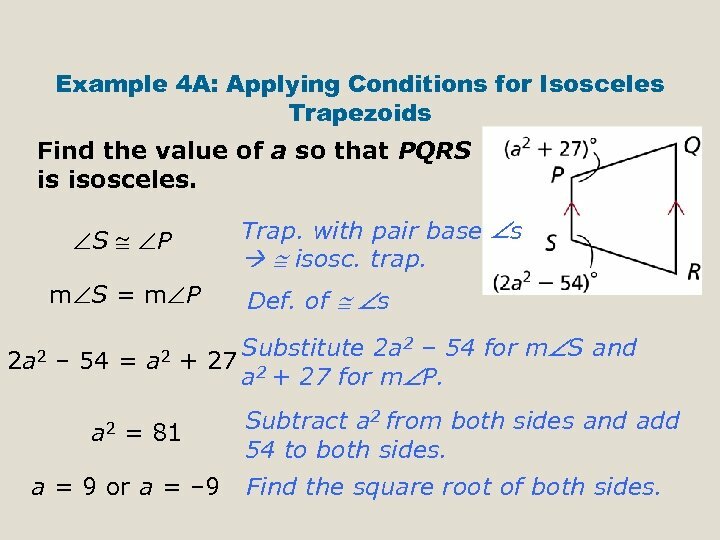 Example 4 A: Applying Conditions for Isosceles Trapezoids Find the value of a so that PQRS is isosceles. Trap. with pair base s isosc. trap. S P m S = m P 2 a 2 – 54 = a 2 Def. 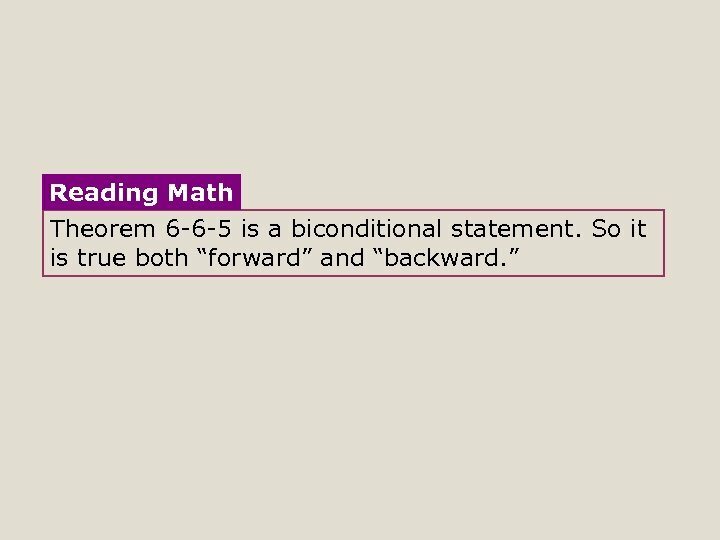 of s Substitute 2 a 2 – 54 for m S and + 27 2 a + 27 for m P. = 81 a = 9 or a = – 9 Subtract a 2 from both sides and add 54 to both sides. Find the square root of both sides. 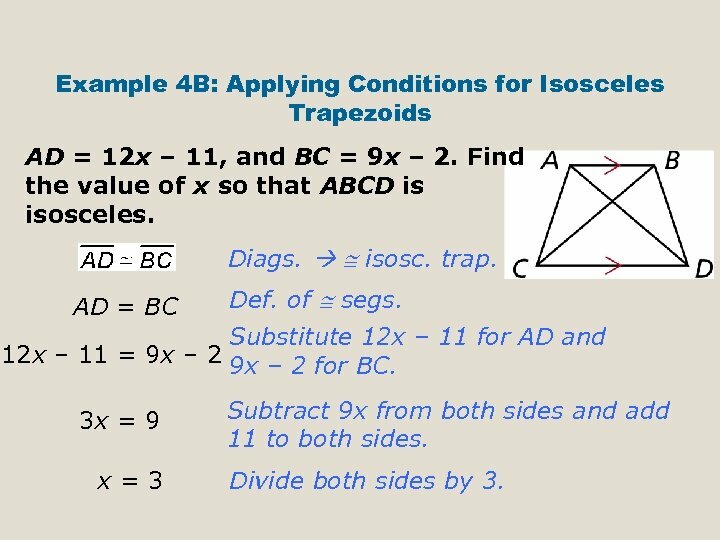 Example 4 B: Applying Conditions for Isosceles Trapezoids AD = 12 x – 11, and BC = 9 x – 2. Find the value of x so that ABCD is isosceles. Diags. isosc. trap. AD = BC Def. of segs. Substitute 12 x – 11 for AD and 12 x – 11 = 9 x – 2 for BC. 3 x = 9 x=3 Subtract 9 x from both sides and add 11 to both sides. Divide both sides by 3. 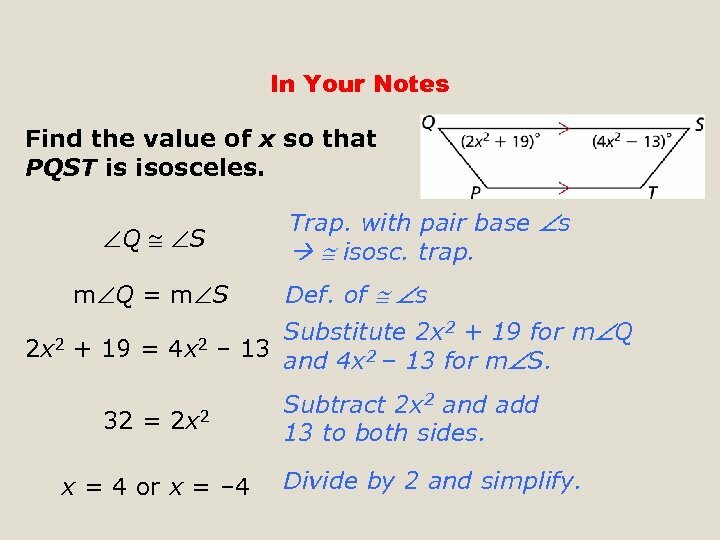 In Your Notes Find the value of x so that PQST is isosceles. Q S m Q = m S Trap. with pair base s isosc. trap. Def. of s Substitute 2 x 2 + 19 for m Q 2 x 2 + 19 = 4 x 2 – 13 and 4 x 2 – 13 for m S. 32 = 2 x 2 x = 4 or x = – 4 Subtract 2 x 2 and add 13 to both sides. Divide by 2 and simplify. 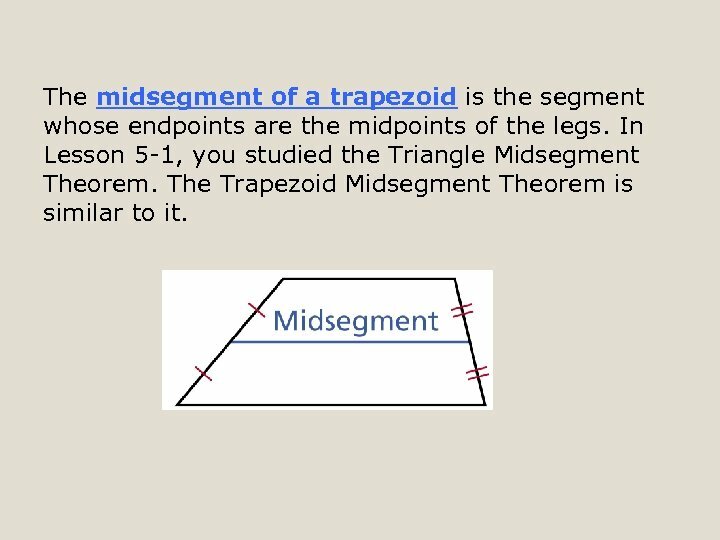 The midsegment of a trapezoid is the segment whose endpoints are the midpoints of the legs. In Lesson 5 -1, you studied the Triangle Midsegment Theorem. 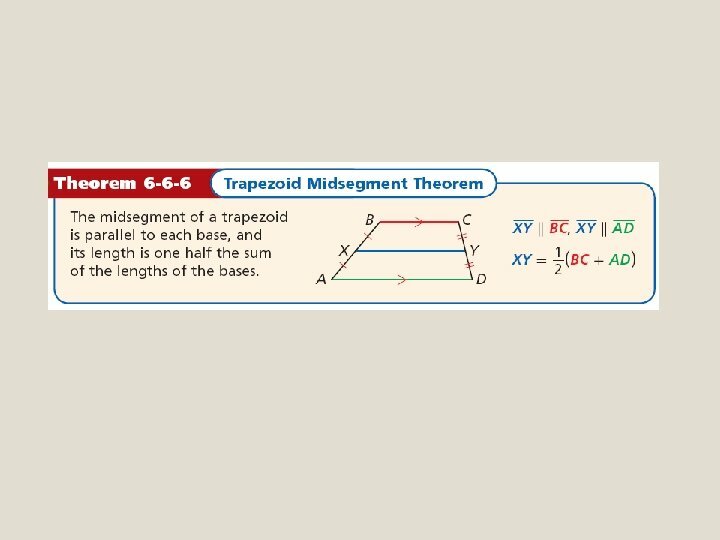 The Trapezoid Midsegment Theorem is similar to it. 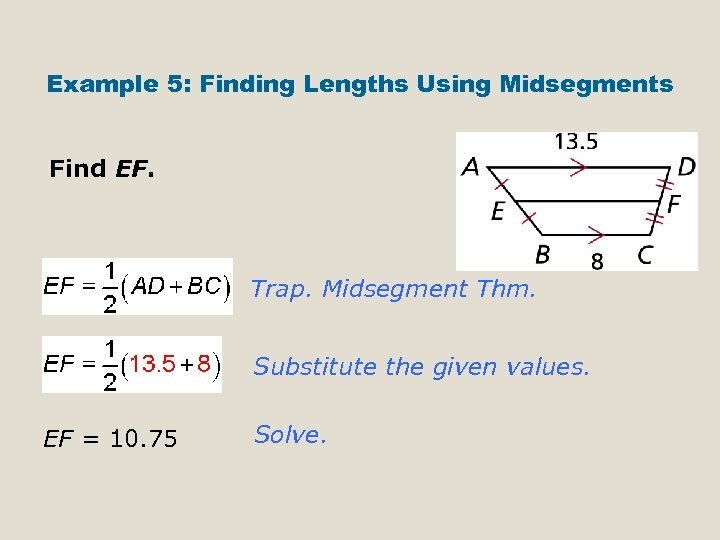 Example 5: Finding Lengths Using Midsegments Find EF. Trap. Midsegment Thm. Substitute the given values. EF = 10. 75 Solve. In Your Notes Find EH. Trap. Midsegment Thm. 1 16. 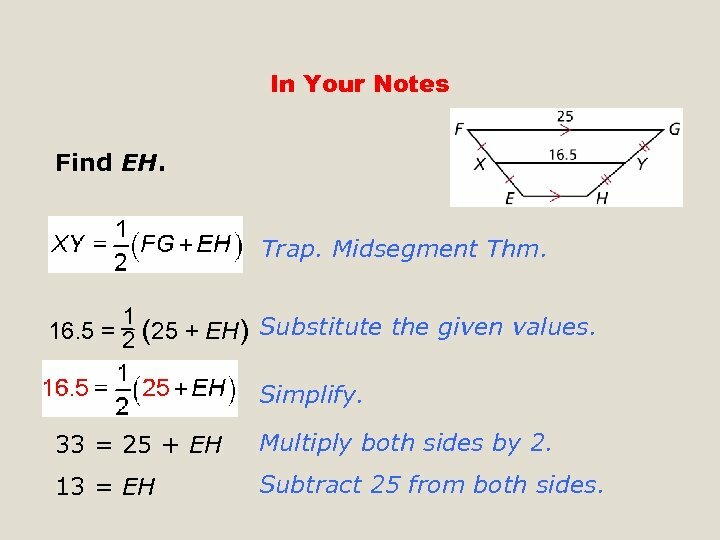 5 = 2 (25 + EH) Substitute the given values. Simplify. 33 = 25 + EH Multiply both sides by 2. 13 = EH Subtract 25 from both sides.